The weather may be cold outside, but Jackson County’s restaurants are on top of their game, serving up warm, comforting dishes to satisfy any craving. From cocktails to appetizers, dinners to desserts, a few of Jackson County’s restaurants share their favorite winter recipes. Now you can make a dish to impress! Layer all the booze and cream using a spoon. Hold the spoon on the side of the glass to create a nice layered effect. It’s very impressive to guests! Then fill glass with ice and a splash of soda. Tastes like a violet chocolate! Recipe courtesy of The Cut Cocktail Lounge in Sylva. Rinse uncooked quinoa and cook 5 minutes in 4 cups of water and allow to cool. Wash kale, remove stalks and chop finely. Mix half the olive oil in with the kale and massage the leaves. Combine spices, lemon juice and remaining olive oil and mix in with the kale. Keeps up to 3 days. Recipe courtesy of City Lights Café in Sylva. Combine walnuts, sugar, and butter into a sauté pan on medium heat stirring constantly until sugars have melted and coated the walnuts. Immediately transfer to parchment paper and, using two spatulas, separate so nuts do not stick together. Let rest for five minutes to harden. Chop 1 ½ cups to put in corn bread and enjoy snacking on the rest. Combine chopped candied walnuts, cornmeal, baking soda, baking powder, salt, and sugar and whisk thoroughly to incorporate ingredients evenly. In separate bowl, combine beaten eggs with buttermilk, then add to the cornmeal mixture. Mix in melted butter and whisk until batter is even consistency. Take a large cast iron skillet and butter the bottom and sides very generously. Transfer batter into skillet and bake at 350 for 30 to 35 minutes or until batter no longer moves in center when skillet is shaken. Remove seeds and peel squash, then cut into 1×1 inch cubes. Set aside in mixing bowl. Mix all spices, brown sugar and olive oil together until it makes an even mixture. Spread evenly over squash then toss to coat all pieces evenly. Bake at 375 for 30 min or until squash pieces are semi soft. Melt butter in sauté pan and add figs. Sauté the figs on medium heat until they start turning golden brown on outsides, about 4 to 5 min. Add cranberries stir and cover for 5 minutes or until all the cranberries have popped. Deglaze the pan with white wine then add brown sugar and orange juice. Stir and reduce for 5 to 10 min or until it begins to thicken, then turn off the heat. Take the four duck breasts and cross-score the fat side. Place fat side down in very hot sauté pan. Sear the duck, draining off fat when needed, until it is deep golden brown, then turn over and cook for 2 to 3 more minutes. 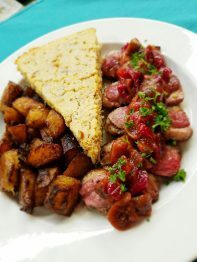 Remove from pan and thin- slice all four breasts, cover with fig cranberry sauce and place on a baking pan into the medium heat oven for 7 to 10 minutes, depending on how well you would like your duck cooked: 7 to 10 min should give you a nice medium rare to medium. 10 to 15 will be medium to well done. Take all three dishes and serve together on a plate ready to savor with your friends and family this holiday season. 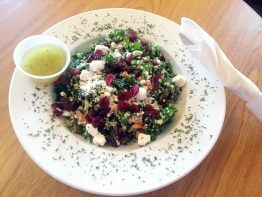 Recipes by Chef Perry Matthews of Guadalupe Cafe in Sylva, NC. Butter a 9-inch or 13X9X2-inch pan. 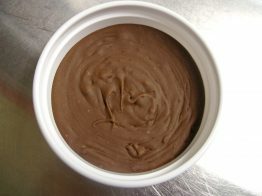 Melt semi-sweet and milk chocolate in a double boiler. Cover and set aside. Combine evaporated milk, marshmallow crème, sugar, butter and salt in 4 quart saucepan. Cook over medium heat, stirring constantly, until mixture comes to a full rolling boil; approximately 240 degrees F; boil and stir constantly for 8 minutes. Remove from heat and immediately add melted chocolate stirring until completely melted. Pour into buttered pan and cool.Yield 4 ½ lbs. of fudge. Recipe courtesy of Baxley’s Chocolates in Sylva. In a bowl, whisk together sugar and cocoa powder. To the sugar and cocoa mixture, add the hot water. Bring 6-8 cups of milk to boil (less milk for a more chocolatey flavor). Remove from heat and add the chocolate sauce mixture. Stir until incorporated, top with marshmallows or whipped cream if desired, and enjoy! 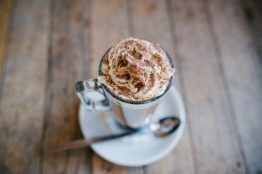 For a little extra fun, try adding flavorings to your hot chocolate like, Caramel sauce, peppermint extract, coffee/espresso, vanilla extract, Kahlua, or Baileys! Recipe courtesy of Cream & Flutter in Cashiers.